After reading the popular book, “Piggie Pie" by Margarie Palatini, students will squeal with delight while participating in the great pig hunt, chase the pig, and other activities that go along with the book while teaching math, language, and reading skills. What child wouldn’t love a book about a bunch of clever, little pigs that outsmart a mean, old witch in search of pigs to put in her Piggie Pie? After reading this fun book, you can trick your students into practicing odd and even numbers, contractions, adjectives and other skills through the engaging Piggie Pie activities found below. Help your students learn contractions with this fun contraction disguises file folder game. The teacher will print, color and cut-out 16 pigs, 4 cows, 4 ducks, 4 chickens, and 4 farmers. Write the two words that make up the contraction on the pigs, laminate them and glue to a manila folder. The other animals need to have the faces cut out of them because they will be the pigs' disguises. The pigs face will show through the cow, duck, chicken, and farmer's body (like a mask). Write a matching contraction on these with a black marker and laminate them. The students will find the contraction that matches and place the disguise over the correct pig. Young students will barely notice they are practicing odd and even numbers while playing this interactive game. 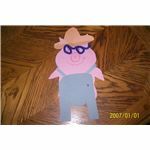 Have each child color and cut-out five pigs. The students are going to pretend that they are Gritch the witch in search of pigs to put in their piggie pie. The kids will put witch hats on obtained by the teacher from a costume shop or craft store. (You could even make paper ones if desired.) The teacher writes an even or odd number on the pig cut-outs and hide them around the classroom. Half of the class will be in search of odd pigs and the other half in search of even pigs. Little witches will return to their desks with even or odd pigs. The teacher will check to make sure they have found the correct pigs. Repeat the exercise having odd children find even pigs and even children find odd pigs. The book, Piggie Pie is ideal for teaching adjectives since the book contains many examples. Before beginning this activity, review what an adjective is. Tell the students you are going to read the story again, but this time you want them to listen for adjectives. Stop reading after each page and ask them to name the adjectives. List them on the board. Tell students they are going to make a Piggie Pie emergent reader and illustrate their books. Print out several sets of these sentence strips. Give each student a copy of the sentence strips, twelve pieces of plain, white paper and art materials. The students will take their sentence strips, read them, arrange them in the correct sequential order, and glue each strip on the bottom of piece of paper. Students are to draw a picture to correspond with their sentence strip with markers and crayons. Staple the pages of the book together. Circle the adjectives. Print out this finished example of the Piggie Pie emergent reader. While half of the class is working on their books, the other half can be reading this emergent reader with the teacher. They can use these books to help them correctly sequence their sentence strips.This activity reinforces story sequencing, adjectives, art and reading skills. This circle time game reinforces social skills and interaction. Children will sit or stand in a circle. The teacher will give one student a stuffed pig. The child passes a stuffed pig around the circle while the music plays. After five seconds, another student passes a stuffed witch in the opposite direction. Kids make the appropriate sounds as they pass the toys around the circle (oinking when passing the pig, cackling when passing the witch). Eventually Gritch "catches" the pig, when one child is left with both the witch and the pig. That child sits in the middle of the circle. When just a few kids remain around the circle, players start a new game. The teacher will give each child a pig cut from pink poster board. 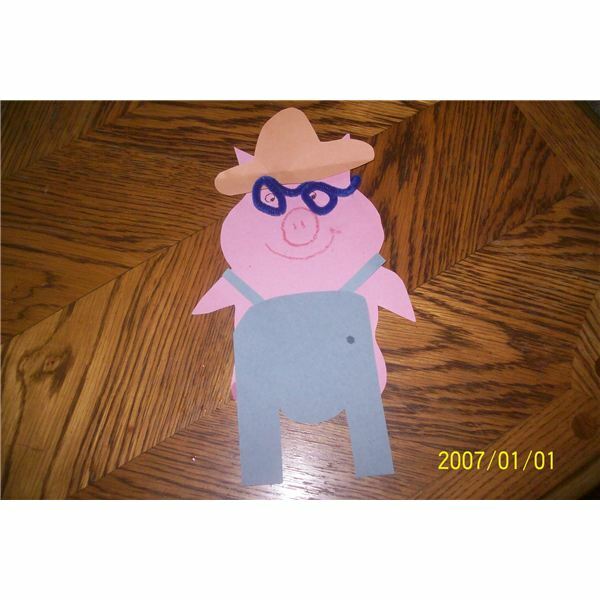 If the teacher doesn't have a template, a pig printable can be found on the internet to print out or trace around (see below for some examples). The children will use markers, paints, glitter, sequins, scraps of material, glue and other art materials to make a disguise for their pig. Before beginning the craft, have students do the motions to the "No Piggie Pie" poem and fingerplay. Children love creating things and eating them. Make a mini Piggy Pizza Pie for snack time. Have the students take a round biscuit and slightly flatten it. Take the second biscuit and tear two pieces off it and form two small triangles (pig ears) and attach to the top of the first biscuit. Spread pizza sauce on the first biscuit. Then add two black olives for the eyes, Canadian bacon for the nose with two slithers of green pepper for the snout and three slices of pepperoni to form the pig’s mouth. Sprinkle with mozzarella cheese. Bake in the oven the time and temperature specified on the Pillsbury Biscuit Package. Enjoy your piggy pies. Using books and stories like Piggie Pie are a great way to teach children about morals, values and other life sills. Be prepared for your classroom to be tickled pink while participating in these interactive activities. Enjoy! Fingerplay, crafts, emergent reader, photo and activities courtesy of Lisa King, all rights reserved. Palatini, Margie. Piggie Pie. Sandpiper. August 18, 1997.